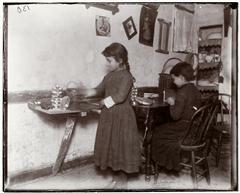 Danish-born Jacob Riis (1849-1914) was a journalist, social reformer, and social documentary photographer. 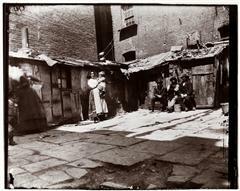 He is best known for his 1890 book How the Other Half Lives, which brought public attention to New York's squalid housing, sweatshops, bars, and alleys. 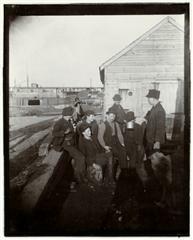 The Museum holds the complete collection that Riis used in his writing and lecturing career, including images he made, commissioned, or acquired. 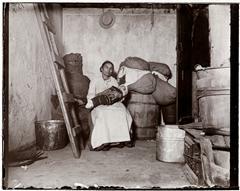 These depict men, women, and children of all nationalities at home, work, and leisure. 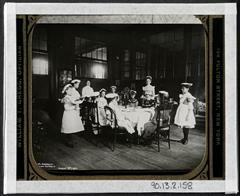 This collection contains vintage prints, glass-plate negatives, and lantern slides, as well as a set of recently produced prints from all of Riis's original negatives. 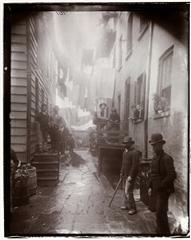 Bandits' Roost - a Mulberry Bend Alley. 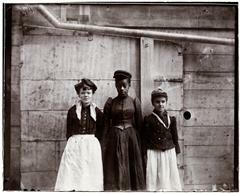 The Short Tail Gang (Corlears Hook) Pier at foot of Jackson Street, now Corlears Hook Park. Photographed from the Police Boat. 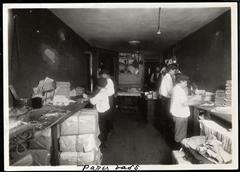 The Board of Election Inspectors in the Beach Street School. A "Scrub" and her Bed -- the Plank. 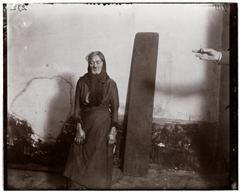 An old woman with the plank she sleeps on at the Eldridge Street Station women's lodging room. I Scrubs. Katie, who keeps house in West Forty-ninth Street. 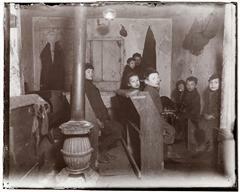 Lodgers in a crowded Bayard Street tenement - "Five cents a spot." 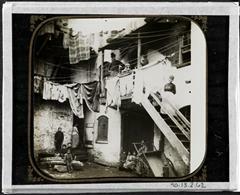 In the home of an Italian Ragpicker, Jersey Street. 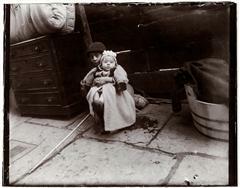 Italian mother and her baby in Jersey Street. 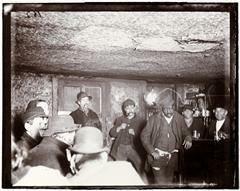 Men in a crowded in an "Black and Tan" dive bar. An Italian Home under a Dump. "Slept in that cellar four years." 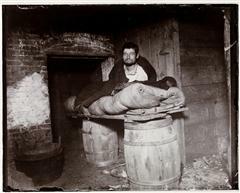 A man atop a make-shift bed that consists of a plank across two barrels. 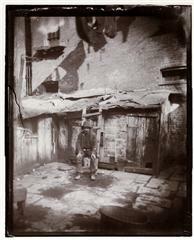 Ready for Sabbath Eve in a Coal Cellar - a cobbler in Ludlow Street. 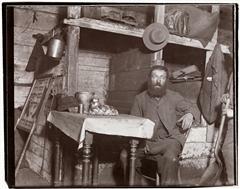 A pipe-smoking man seated in a yard in front of a ramshakle shanty. 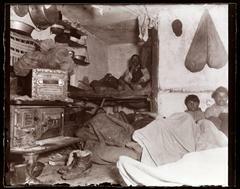 Street Arabs in sleeping quarters. 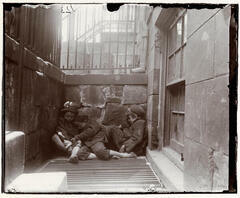 Three children curled up on a metal grate in a below-grade areaway. 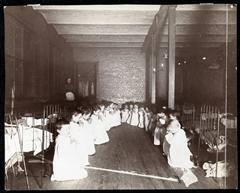 Prayer time in the nursery, Five Points House of Industry. 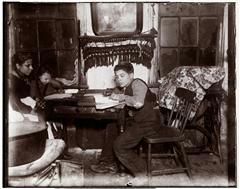 Talmud School in a Hester Street Tenement. 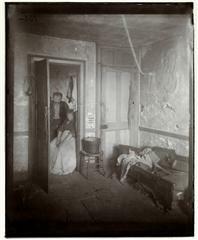 The Church Street Station Lodging-room, in which I [Jacob A. Riis] was robbed. An All-Night Two-Cent Restaurant, in "The Bend". 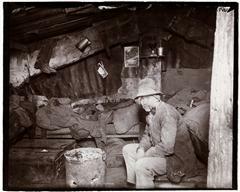 It costs a Dallar a Month to sleep in the Sheds. 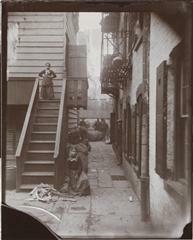 A woman holding a child, and men sitting in a rear yard of a Jersey Street tenement. Poverty Gappers playing Coney Island. 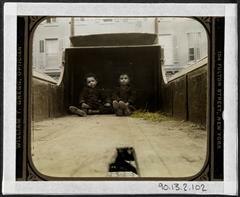 Their playground a truck -- Baxter Street. "Minding the Baby," Cherry Hill. 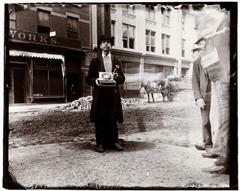 Hester Street. The Street, the school children's only playground. 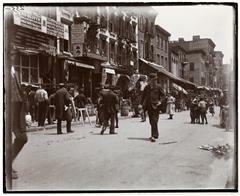 Daytime foot traffic on Hester Street. 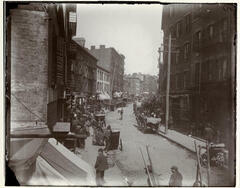 Indians (Iroquois) at 511 Broome Street. 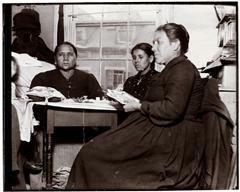 Three Iroquois women working at a table. 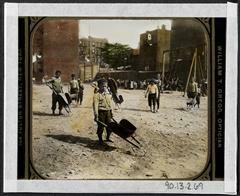 Poverty Gap Transformed -- the spot where Young Healey was murdered is now a playground. 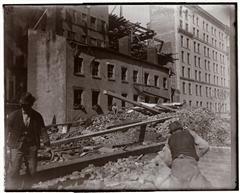 New York, Old house (torn down) in Bleeker Street, on a back lot between Mercer and Greene Streets. 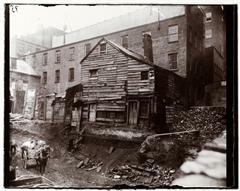 A rear-lot house on Bleecker Street as seen from an adjacent excavation site. 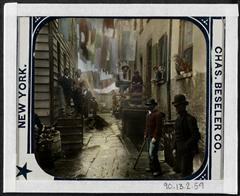 Baxter Street Alley in Mulberry Bend, now destroyed. A woman with an infant seated at a table with a boy using writing tools. The Potter's Field, the Common Trench. 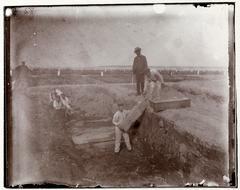 Laborers loading coffins into an open trench at the city burial ground on Hart's Island. 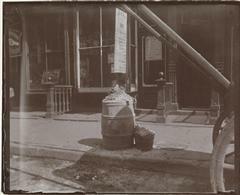 An ash barrel on the sidewalk. 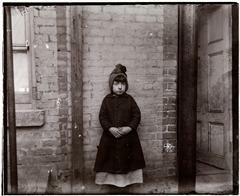 "Little Susie at Her Work," Gotham Court. The "Slide" that was the Children's only Playground once. 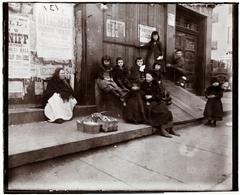 Children and a woman sit on an inclined cellar door. A Growler Gang in Session. 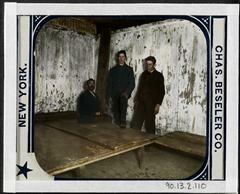 Getting Ready for Supper in the Newsboys' Lodging House. 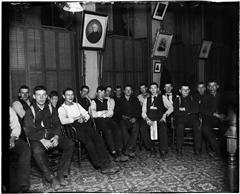 Newsboys cleaning their faces in a lodging house washroom. 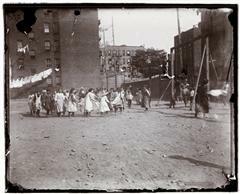 Saluting the Flag in the Mott Street Industrial School. 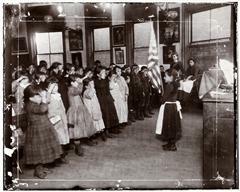 Young students salute the American flag at Mott Street Industrial School. 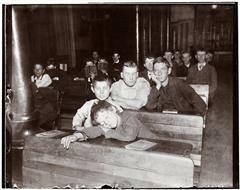 Night school in the west side lodging house. 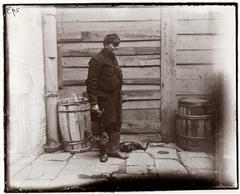 Edward, the little pedlar, caught napping. 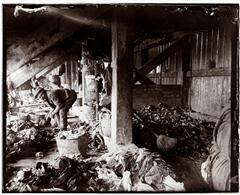 Under the Dump at West 47th Street. 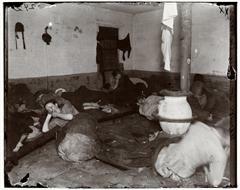 Women's Lodging Room in Eldridge Street Police Station. 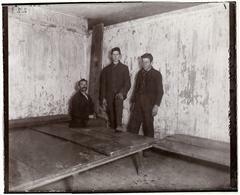 Women sleeping on plank beds and the floor. "Playground" of the Essex Market Public Shcool, Row of Closets [Toilets] Opening on It. 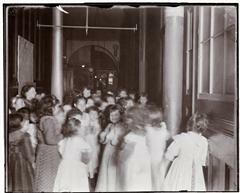 A hallway at the condemned Essex Market School filled with students playing. 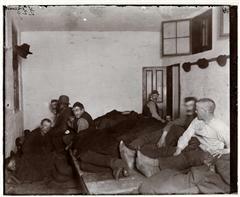 Lodging Room in the Leonard Street Police Station. Old Barney in Cat Alley. 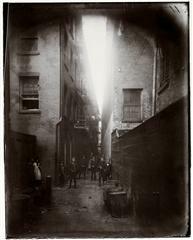 Cat Alley, when it was being torn down. 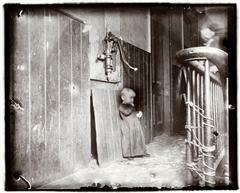 Baby in slum tenement, dark stairs--it's playground. Showing their trick, Hell's Kitchen boys. 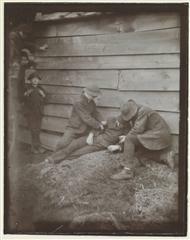 Boys in Hell's Kitchen demonstrating how they rob people who have passed-out. 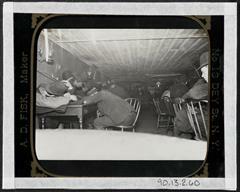 A Flat in the Pauper Barracks, West Thirty-eighth Street, with all its Furniture. A room in a Hell's Kitchen tenement flat. Court at No. 24 Baxter Street. 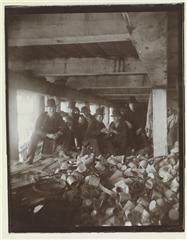 The 'Soup House Gang' Class in History in the Duane Street Newsboys' Lodging House. Organized Charity. 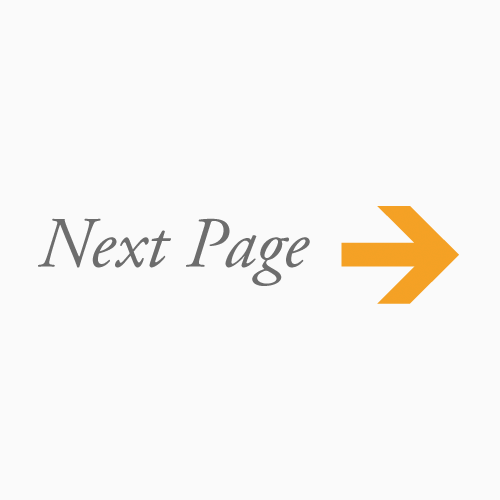 Night Messenger Service. The Potter's Field Consecrated Ground. 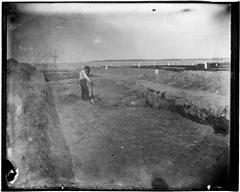 A man covering coffins with dirt in an open trench at the city burial ground on Hart's Island. 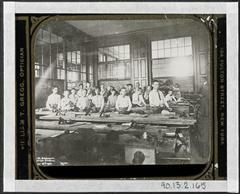 Manual Training Class, Public School. 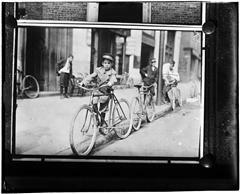 Boys in summer school wood shop class at Brooklyn's P.S. 32. Waiting at table, vacation school. 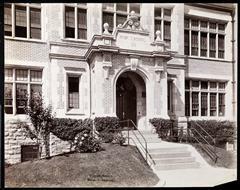 Main Entrance of Public School 153 Bronx. 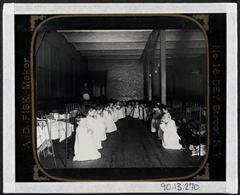 Prayer-time in the Nursery - Five Points House of Industry. 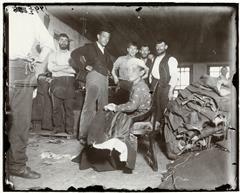 Four boys standing at counter-tops making paper bags.